This historical generational horror/suspense/science fiction audiobook defies genre classification as it has intrigue and terror. It is a Centenary retelling of the Titanic story to destroy all the false legends surrounding Titanic. "From a master of terror and suspense," according to Clive Cussler, author of Raise the Titanic, herein lies a compelling reason that forces Captain Edward J. Smith to scuttle his own ship - RMS Titanic. What dark secret prompts such an action on the part of a veteran, retiring captain on a ship's maiden voyage? What prompts men 100 years later to pillage the wreck of the Titanic? What secret lies buried within the lost ship - a secret that could destroy all life as we know it? The answers are unveiled in April 1912 and in April 2012, and there will be blood…. What a difference an exceptional narrator makes! What does Lee Alan bring to the story that you wouldn’t experience if you just read the book? There is reading a book. There is reading a book well. And then there is a level above both of those. This level involves actually "presenting" a book... with interpretation, with emotion, with drama. And not with just the human voice. This level also involves actual production quality with music and sound effects. You can listen to just the words of a book. But you can also actually experience a book with a reading, an interpretation, and a presentation "par excellence". This is exactly what you will get with the work of Lee Alan. Presentation... total experience... this is the gift of the best audio book narrator I have ever heard. This is the gift of narrator Lee Alan! What disappointed you about Titanic 2012? The narration made it almost impossible to listen to. Excruciating is the most appropriate word I can use. Has Titanic 2012 turned you off from other books in this genre? I would never purchase anything from this narrator EVER! No, even considering it makes my ears hurt. What character would you cut from Titanic 2012? The narrator-I know he's not a character but that's who I'd cut anyway. what are they thinking with this performance? The narrator is dreadful. He reads the story like a man doing a horrible impression of one of those actors on tv who advertise class action lawsuit services by pretending to be a tough, cut-throat attorney. But that is NOT the worst part. I will not be able to comment fairly on the story itself, because I will not be able to make it past the second 20 minutes. This audiobook has a non-stop, mind-boggling, pointless , shrill instrumental music soundtrack that is so distractingly loud, pointless, with no relationship to the story, that you will want to throw your device out the window. This is by far the worst production I have ever bought. I want my money back so I can just buy the book and read it. Would you recommend Titanic 2012 to your friends? Why or why not? NOT the audiobook. Buy the book if the story interests you. Different narrator, NO soundtrack of any kind. Ever. Never. Ugh. Headache inducing to the ultimate. The director or producer or whoever was the mastermind behind demolishing what might be a good book. I would like a refund of my credit. If they had forgone the sound effects and had a different narrator. This was the only book I really could not listen to. What was most disappointing about Robert W. Walker’s story? What didn’t you like about Lee Alan’s performance? Would you try another book written by Robert W. Walker or narrated by Lee Alan? 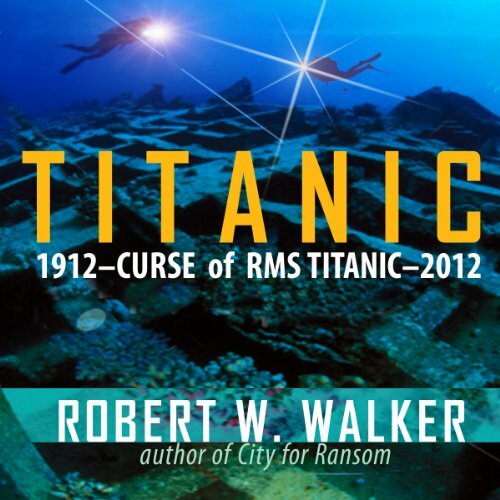 Would you ever listen to anything by Robert W. Walker again? Who might you have cast as narrator instead of Lee Alan? Maybe enjoyable if it was not for the endless music and seagull sounds effects. Accents are just really bad. What would have made Titanic 2012 better? A good editor. The audiobook was just over 19 hours. A decent editor could have easily cut a few hours off that and the book would have been much the better for it. There was so much repetition, a great deal of it sounding as if the author wrote two versions of a passage and forgot to take one out before publishing. Characters would often also say the same thing over and over and over again, sometimes word for word! I didn't mind the Inspector Ransom character in the earlier timeline so would consider giving Walker another chance in the hope that the book would be better edited. What does Lee Alan bring to the story that you wouldn’t experience if you had only read the book? While I'm not sure about his accents, I did enjoy the performance of the earlier timeline's characters and I felt like I was listening to a gravelly old detective and his young assistants. But… I'm the type of listener who isn't easily annoyed by a narrator and it takes a lot for them to really put me off. I've never yet stopped an audiobook just because of the narrator. Having said that, by halfway through the book I came closer to hitting pause every time I heard a character's laughter. Irritation and disappointment… this book had so much potential. The dual timeline was actually reasonably well plotted and that was all that kept me listening despite the irritating repetition. At the start of the audiobook, the background soundtrack was just that - background. Within a few hours though, it was just another irritation that detracted from the story.